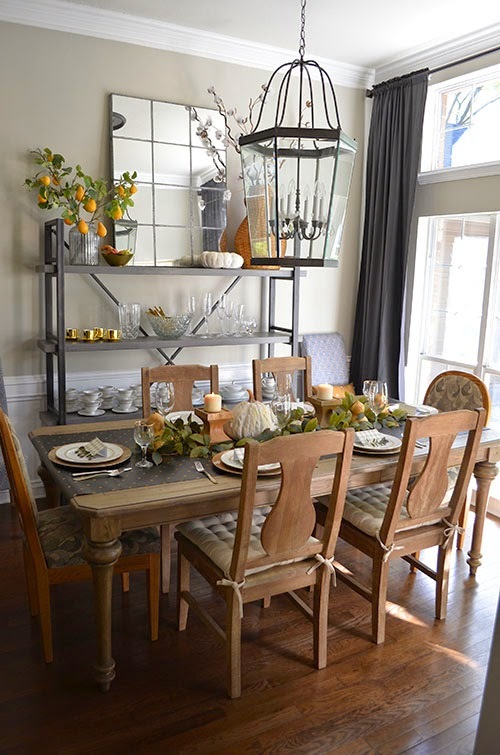 I absolutely love coming up with different ways to decorate our dining table for the holidays. 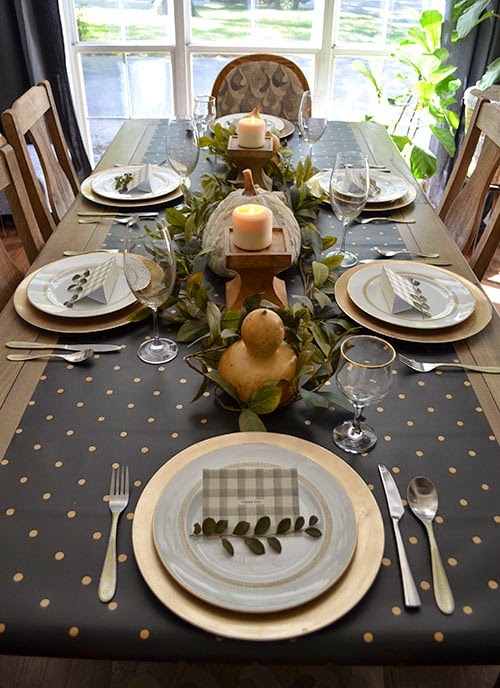 We will be hosting a small gathering for Thanksgiving in a couple of weeks, so I decided a Thanksgiving tablescape was a must. 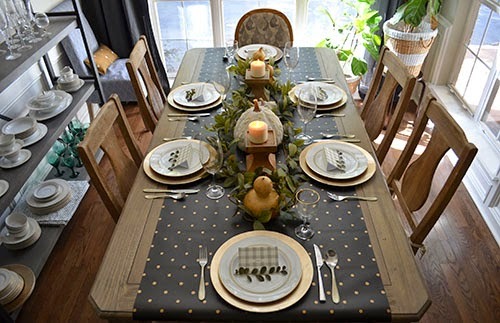 I started out with one of my favorite tablescape tricks – using wrapping paper as a table runner. 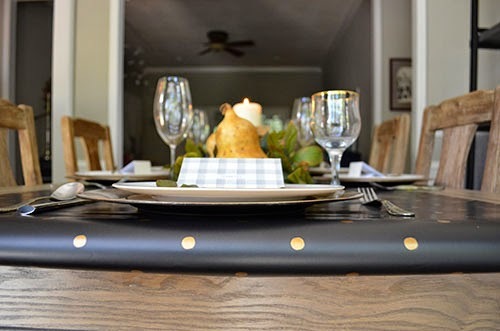 I found this classy black and gold polka dot paper at Home Goods, and it was love at first sight. To use it as a runner, I simply tape it under the edge of my table on each end. 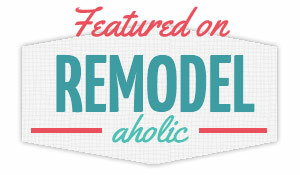 It's doesn't get much easier or cheaper than that! 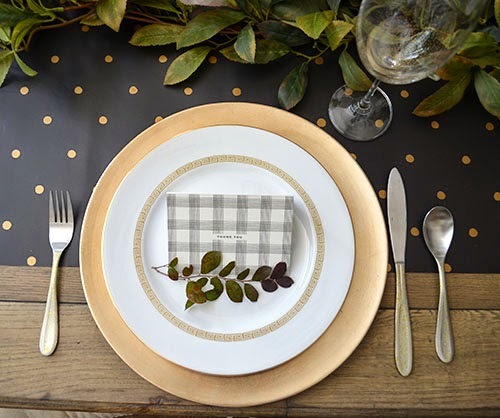 I wanted the table to have a touch of nature along with the glamorous black and gold table runner, so I used my new faux greenery that I picked up at Hobby Lobby to run the length of the table. 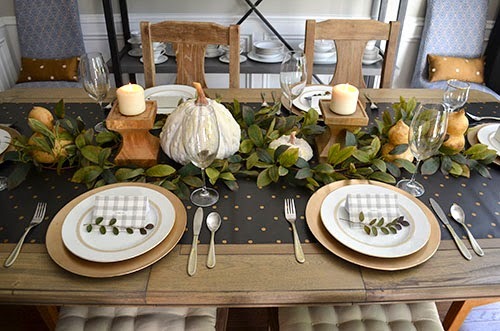 The garland forms a pretty frame around the dried and ceramic gourds. 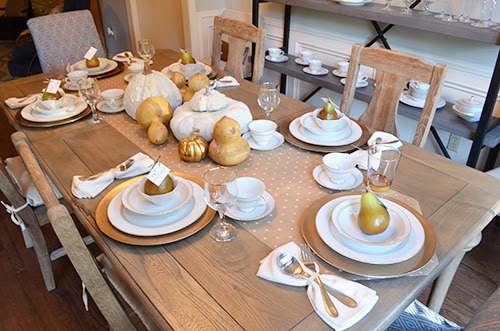 Without those autumnal touches, this table could be appropriate for any occasion. I think it would be equally pretty with some small vases of white roses or magnolias. I was searching through my craft paper for place card inspiration when I spotted this box of thank you cards we've had for years. I was originally going to cover the "thank you" part, but then it occurred to me that it was actually completely appropriate for a Thanksgiving table. It could even be a fun way to interact with your guests, by asking everyone to write down what they're thankful for on their thank you card. To make it lay down nicely on the plate, I simply folded the back side of the card in half, hamburger style. I added the sprig of greenery from my own front yard to each setting for another natural element. 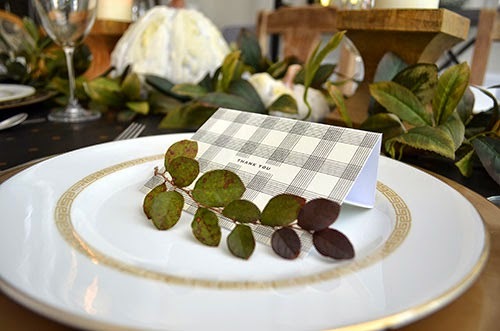 Just like the greenery on the table runner balances out the modern/sleek lines of the wrapping paper, this little sprig helps soften the hard, masculine pattern of the notecard. 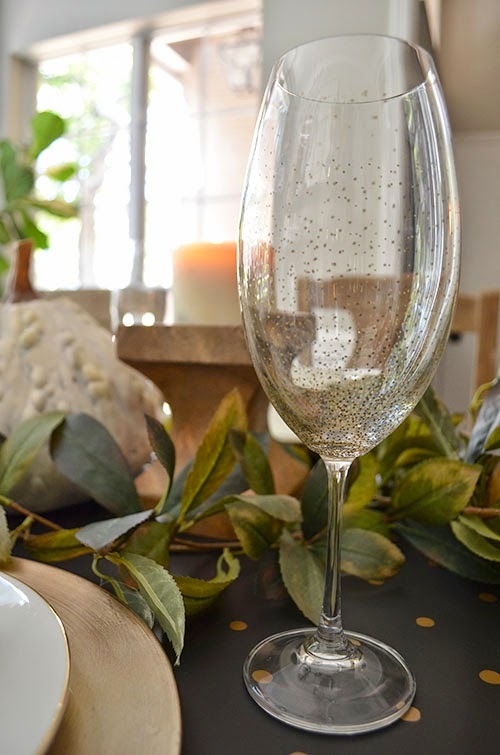 The goblets are another DIY touch. I found a set of 6 on sale at Home Goods for $7, and I used a gold Sharpie to add tiny gold dots. I love the way they turned out; it reminds me of champagne bubbles. 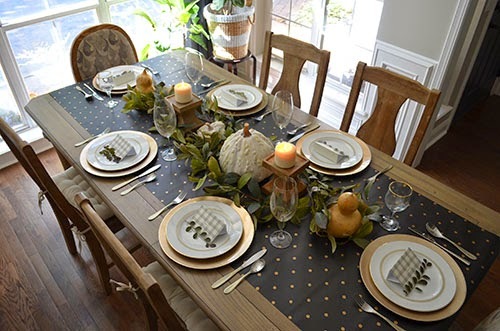 I think this is one of my favorite tablescapes I've ever done, and it was so easy to put together. It took less than 30 minutes from start to finish, and that was with me brainstorming and coming up with ideas as I went along. It's SO simple.